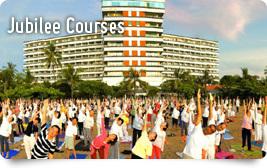 Further information and registration will be available from 1st February 2011. Course starts on 3rd July at 19:30 and ends on 4th July after dinner at 19:00. Please note that course fee does not include accommodation and transportation. Course starts on 3rd July at 19:30 with Satsang and ends on 6th July after lunch. Course starts on 3rd July at 19:30 with Satsang and ends on 7th July after dinner at 20:00.